My wife and I have about $2 million in savings spread among a series of bank savings accounts, CDs and money-market accounts that we plan to draw on for retirement income in the near future. I keep it all in cash because I like the feeling of security I get from looking at my bank statement and seeing it's all there. Am I being too cautious? --Richard N.
I get why you would prefer the security of bank accounts to putting your savings in more volatile investments like stocks and bonds. Even before the Greek debt crisis roiled the financial markets, many investors were concerned that stock prices had risen to the point where the market could be vulnerable to a significant setback. So if you know you'll soon be tapping your nest egg for steady retirement income, it's understandable you wouldn't want to put it in harm's way. Then again, even assuming your collection of savings vehicles is totally covered by federal deposit insurance (which you can check by going to the FDIC's Electronic Deposit Insurance Estimator tool), it still may not be the paragon of financial security you think. Even if you shop diligently, you're doing well these days if you can earn even 1% annually on such accounts. Meanwhile, the core consumer price index (i.e., the CPI minus the volatile food and energy components) has been running at an annual pace of just over 1.7% or so the past year. Which means that while you may take solace in the fact that your account balances never go down, your nest egg's purchasing power is actually declining every month as inflation outpaces your return. What's more, when you finally start drawing on your savings stash for retirement income, the lower return you'll earn by keeping it all in cash will likely mean you'll have to settle for significantly less spending cash than you could generate by investing even in a relatively conservative mix of stocks and bonds. How much less? 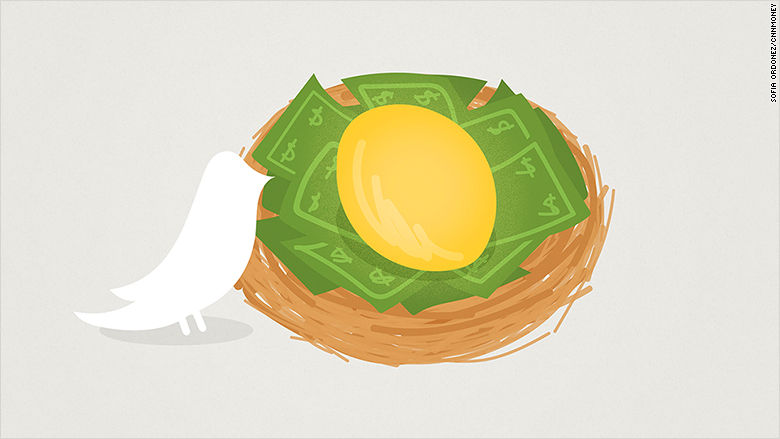 Well, according to T. Rowe Price's retirement income calculator, a 65-year-old who invests his nest egg entirely in savings accounts and other cash equivalents would have to limit his draw from savings to roughly $5,700 a month (which would increase with inflation), assuming he wants an 80% chance that his nest egg won't run out before 30 years. But if that same 65-year-old invests his nest egg in a 50-50 mix of stocks and bonds, he could draw more like $6,700 monthly with the same assurance that his nest egg would support him for 30 or more years. If having a significant portion of your nest egg in stocks would keep you up at night or if you feel you would freak out and sell in a panic if the market goes into a prolonged slide, then even a relatively tame 50-50 mix might not be right for you. That said, you should also at least be aware of what you might be giving up if you continue to keep your entire nest egg in cash equivalents. So you may want to run some scenarios comparing an all-cash stash with different blends of stocks and bonds on the retirement income calculator. Or if you're not confident about doing this sort of number crunching on your own, you might hire an adviser to run some numbers for you and show you what you might be able to gain in extra retirement income by devoting even a small part of your savings to a diversified portfolio of stocks and bonds. When you're ready to start drawing income, you might also consider putting a small portion of your savings into an immediate annuity, which will provide you an assured monthly check for life regardless of how the market is behaving (or misbehaving). For example, a 65-year-old man who invests $200,000 in an immediate annuity today would receive about $1,120 a month for life; a 65-year-old woman would get roughly $1,050; and, a 65-year-old couple (man and woman) would receive about $940, according to ImmediateAnnuity.com's annuity calculator. With the security that comes from knowing you can count on that income, plus Social Security, you may also feel more willing to invest some of your remaining stash in a portfolio of stocks and bonds. Ultimately, you must invest your savings in a way that leaves you feeling at ease. But remember, no investing strategy can totally eliminate risk. And the one that seems the safest from one point of view may have downsides you haven't considered.